Have you checked out our new Woodland Duos stamp set yet? This set is so perfect for creating fun valentine cards! All three of the sweet couples fit inside the big heart in our Darling Hearts die set! For this card I stamped the two cutie raccoons with Archival black ink on watercolor paper and colored them with Zig Clean color markers. Then I added them to this card along with some strips of simple patterned papers. I added a couple of banners too, stamping the "love bandit" sentiment onto one of them. 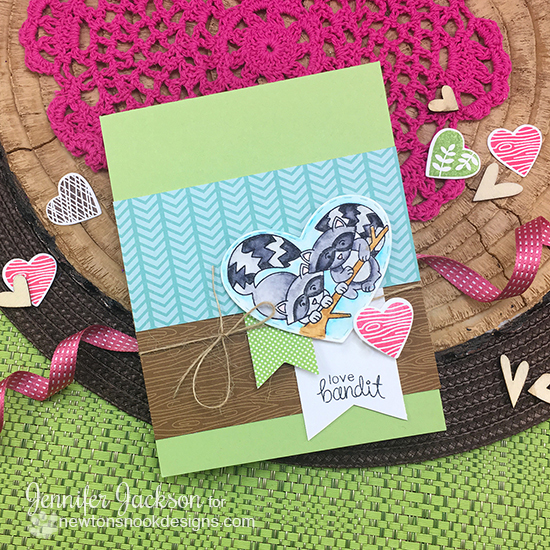 I always like to refer to raccoons as "bandits" so I couldn't resist adding the "love bandit" sentiment to this set when I designed it! To finish off the card I added some twine and the woodgrain patterned heart, stamped in hot pink ink to give it a fun pop of color! Hope you enjoyed this cute little duo today and are inspired to create some woodsy Valentine cards! Absolutely adorable and so cute!!! Love how you used pattern paper! The layout is awesome and I really like the colors. Darling card!